Good Morning! 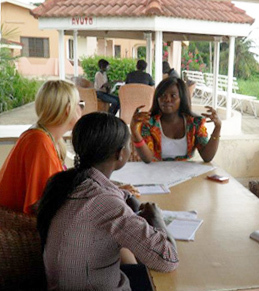 Premier Volunteers of Ghana (PREVOG) is now known as Inside Africa Volunteer (IAFRIVO) We are one of the leading travel abroad, volunteer or internship organizations without any political or religious affiliations. We place special focus on community development projects, including wide range of humanitarian and community outreach projects. 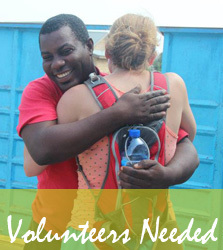 IAFRIVO has also partnered with reputable organizations in Ghana looking for international volunteers and interns. Our projects are carefully designed for all persons, students, recent graduates and individuals from all academic backgrounds and all levels of experience. The programs include tailor made short term and long term experimental study abroad programs for school credit or for career development. We have outline Internship projects that are specifically designed to offer the widest range of experience and training. We have connected with reputable organizations and companies looking for international interns. These internship and work experience are designed for students, recent graduates and professionals to gain added experience as well as build upon a resume that has international image. In other to let you get a deeper understanding and appreciation of the country, the people, the way of life and to get your bearings on everything is to guide you through an in-depth perspective of the cultural activities of the African way of life. Our always-available Directors will coordinate a city orientation and tour at the beginning of each program to familiarize you with your new surroundings and host family. Our mission is to strive to develop the global world by bridging the gap gradually between the privileged and the underprivileged by providing support to deprive and needy communities. 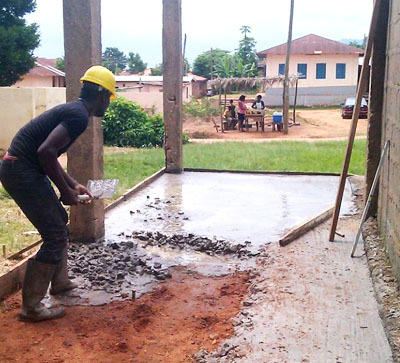 IAFRIVO has an outline of projects it wishes to undertake in the rural and deprived areas of Ghana with the help of well meaning volunteers, individuals and organizations to partner us in other to achieve these objectives. We are always looking for volunteers, ideas, partnership and work to help sustain the noble course by previous volunteers. 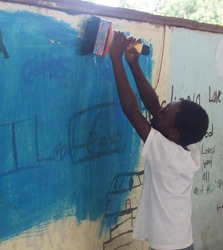 IAFRIVO promotes International I volunteering, Students Exchange Programs. We are also dedicated to meeting humanitarian needs, promoting cross culture and people integration. We welcome international schools, organizations and institutions that are interested in these direction. The project in which I participate offers me a unique insight into the African Fashion as well as education of future Designers. My work includes Fashion illustration, fashion math, fashion science and my favorite area: Garment Construction. Personally, I enjoy every single day at Abbi Creation because the teacher support and comfort me. With the students I have an intense relationship and I found a lot of friends. I am glad that I chose this project because for me it was the perfect possibility to prosper my knowledge in Fashion and chiefly get an authentic view towards the African culture. The experience influenced me and it will definitely be an advantage for my future career in the Fashion industry. I came to Ghana on October 30, 2017 and generally I really love Ghana and its people. Accra is great to go out and spend relaxing time with others in a bar or at the beach, but Ghana has much more to offer. Travelling is quite easy and also without any hassle. Even though I felt myself lost sometimes, I always got some help from the locals. The different regions also include a huge variety of nature and cultural traditions. It is worth to explore it and enjoy the beauty of Ghana. Of course it was a cultural shock at the beginning and I had to get used so several traditions, but nevertheless it was an unforgettable time for me and I never want to miss it. I am really sad about leaving Ghana so soon because I feel myself at home. 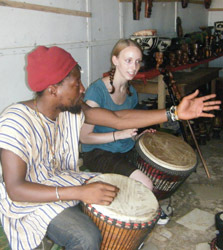 I really would recommend Ghana for people who are open minded towards a new and exciting culture, wants to experience the friendliest community in the world, travelling and just have a memorable time which will last forever. I have to thank IAFRIVO for the opportunity and the personal support during my stay. I always felt welcomed and believe that my remaining months ending April 2018 will be even more memorable. The excitement when you are serious and passionate about a particular volunteering or internship placement. Ms. Larissa, in the photo above had a wonderful internship placement at the one of the leading health care centers in Ghana. Volunteer Internship Opportunities are available in these various departments below; The departments will appreciate your presence. You can choose to combine different departments at the same time. 10 And other health care related departments. It is very helpful to enjoy what you are doing so that you can continue doing it. Think about what you like to do. 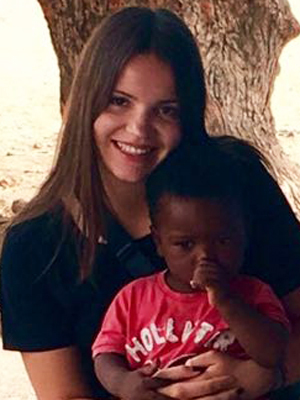 Fortunately, there are various volunteer and internship opportunities that can fit any time arrangement with INSIDE AFRICA VOLUNTEER ORGANIZATION.